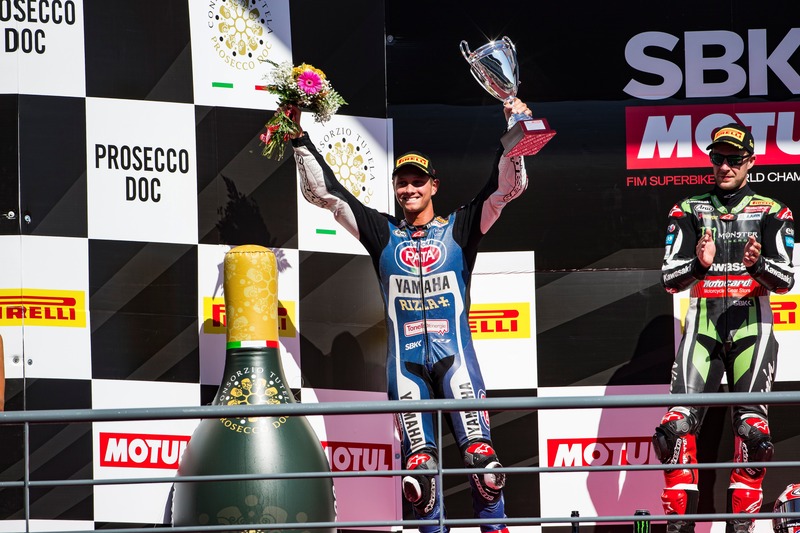 Pata Yamaha Official WorldSBK Team’s Michael van der Mark stormed to his first podium for Yamaha in sensational fashion at Portimao on Sunday, round ten of the 2017 Superbike World Championship. The Dutch rider started on the front row and put in a super performance to bring his Yamaha R1 home in second place, moving up to sixth in the championship standings in the process. His teammate Alex Lowes was charging his way through the field after starting from tenth on the grid but suffered a highside on lap 8 that left him very battered and bruised, but miraculously he escaped any serious injuries. All eyes were on van der Mark after his call-up to fill in for the injured Valentino Rossi in the Movistar Yamaha MotoGP team at the Aragon GP next weekend and he put on a superb display of riding in Sunday’s Race 2 to secure his best result yet for the Pata Yamaha team. Starting from the middle of the front row, the 24-year-old did not quite have the grip levels to push to the maximum during the first few laps and dropped down to fifth, but then settled into a good rhythm and started to close the gap to the riders in front. On lap 4 he passed Leon Camier to move into fourth and set his sights next on Eugene Laverty in third. Showing incredible consistency in his lap times while others started to struggle, the former World Supersport Champion hunted down Laverty by lap 11, making his move and immediately opening up a gap. As the race continued to progress he was matching the pace of Chaz Davies ahead of him before, with 3 laps remaining, Davies crashed out and van der Mark was promoted to second. Continuing to ride hard right until the end after having been denied a previous podium in Misano in the dying stages of a race through no fault of his own, he crossed the line in second place to the delight of his team and fans to collect 20 championship points. This saw him move up to sixth in the championship standings with 166 points, just three points behind his teammate Lowes. Lowes lined up at the front of the fourth row on the grid for Sunday’s Race 2 and when the lights went out he made a good start. A few laps later and he was up into eighth and became involved in an excellent battle with Marco Melandri, Lorenzo Savadori, and Jordi Torres – with Lowes setting lap times that would have seen him battling for the podium – before a huge highside on lap 8 at Turn 13 ended his race. Unbelievably, Lowes walked away battered and bruised but with no serious injuries and the 27-year-old British rider is determined to bounce back at the next round in Magny Cours. After this result, Lowes currently sits fifth in the championship standings with 169 points and will head to France taking the positives from a challenging weekend. The Pata Yamaha Official WorldSBK Team will remain in Portimao on Monday for the official one-day test, before heading to Magny-Cours for round eleven of the 2017 FIM Superbike World Championship on the 29th September – 1st October. Check out the Race 2 results.